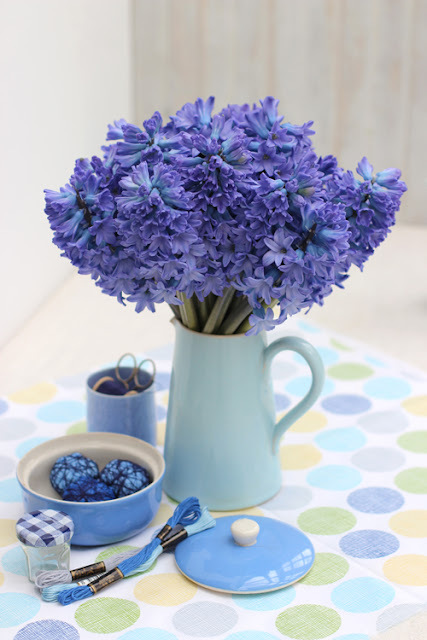 This week I'm featuring some gorgeous blue hyacinths with a symphony of blue "things". 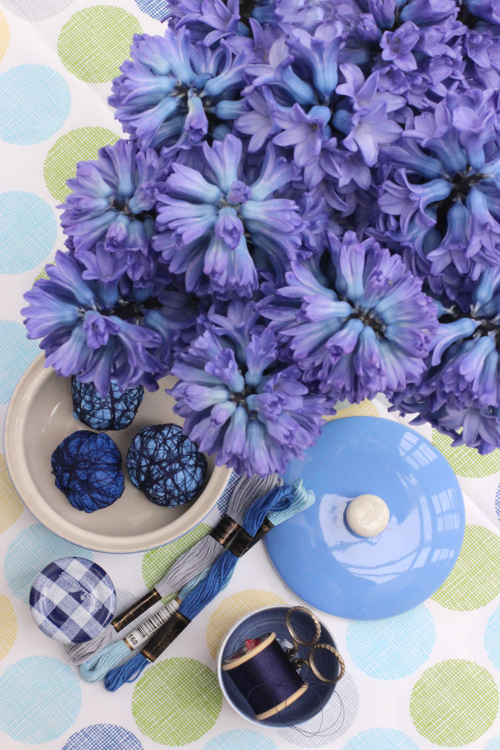 I'm someone who doesn't think that hyacinths are just for Christmas! I just love them at this time of year. And it doesn't matter how - it can be a bulb planted in a pot or in a bulb vase. It can be as cut flowers - on their own or mixed with other flowers that are available now. 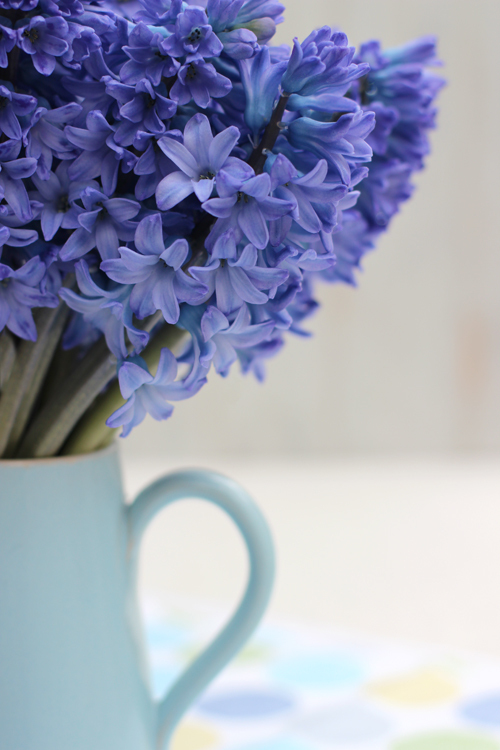 Two bunches of hyacinths and a jug - what could be easier? 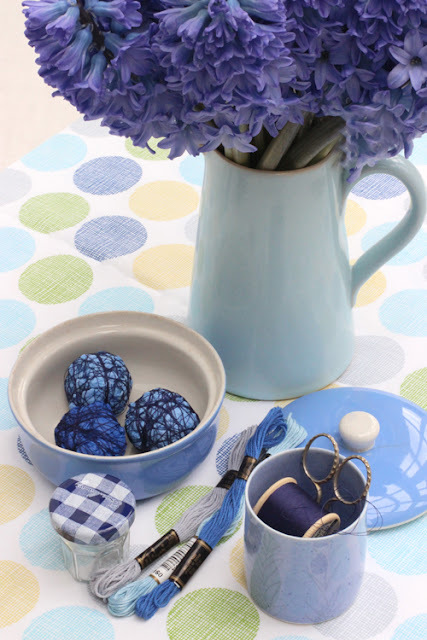 I have used a light blue vintage jug to contrast the dark blue flowers. But it could be a clear glass one or a white jug - think neutral or colour contrast. I have cut off the small bulb-bit at the bottom of the stems and all the leaves to be able to fit them all in the jug. You might want to do that if the jug is of clear glass - it will look a bit neater that way but that is up to you to decide and figure out what look you like. I like to mix old and new so when I gathered together a few blue 'thing' I chose a mix. 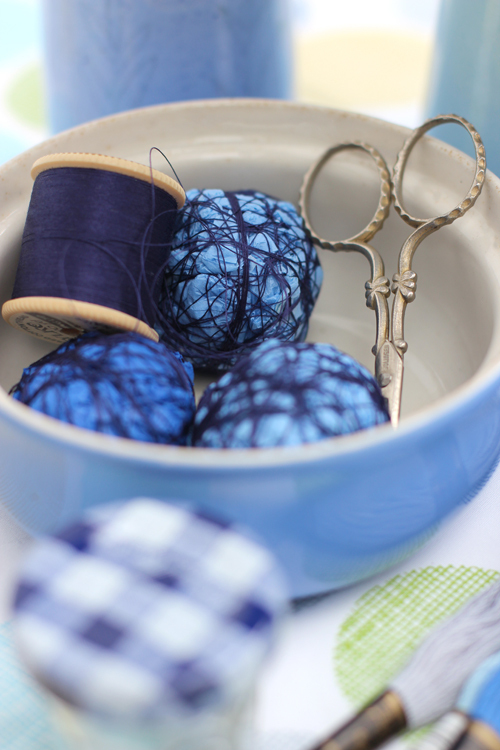 The fabric, mini jam jar, embroidery thread, tealight holder and balls of tissue paper with thread wound around are all new. The butter dish and the pair of scissors are vintage. Go out and find some hyacinths - growing as bulbs or as a bunch of cut flowers. Whatever way they will put a smile on your face and some colour in your home! Have a Fabulous Floral Friday and Weekend! I'll see you again on Sunday with a quote from a flower lover. I thank you for this encouragement to bring some hyacinths home today. Those vintage scissors are also lovely. Une publication très printanière... Très jolie composition. J'aime beaucoup le parfum subtil des jacinthes.